Added by Bill Bowman on February 20, 2019. 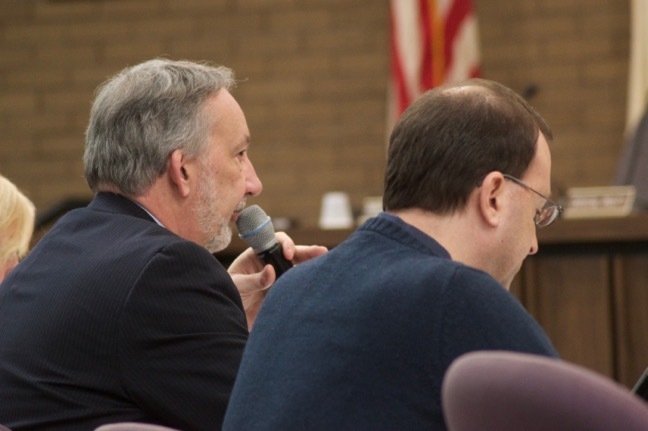 Township Manager Robert Vornlocker, left, and DPW manager Carl Hauck at the Feb. 11 Council budget meeting. Franklin is in a “very good, strong financial position,” the Township Council was told at a Feb. 19 special budget meeting. That prognosis of the township’s revenue position came at the end of the meeting – the second budget meeting in eight days – from township auditor Andrew Hodulik. And as far as debt is concerned, Township Manager Robert Vornlocker told the council that Franklin’s .3 debt ratio – outstanding debt relative to tax base and income – is “phenomenal.” The maximum debt ratio a town in New Jersey can hit is 3.5, he said. “When you look at it from the township’s point of view, a .3 debt ratio is pretty good,” he said. The council on Feb. 19 heard more than two hours of budget requests and nearly four hours of budget requests on Feb. 11. The meetings are the start of the process to create an annual budget. While no solid figures are yet available – the township isn’t expected to adopt the budget until the end of March – Vornlocker told teh council that preliminary estimates are that the budget will increase by about $1.7 million over the $60.1 million spending plan adopted in 2018. Capital requests, usually the budget’s big-ticket items, were discussed at the Feb. 11 meeting. Included in those requests were a number of new marked, unmarked and utility vehicles for the police department, a replacement of the township’s 9-1-1 system, new park playground equipment, solar-powered charging stations for parks, the construction of Catalpa Park, and the township’s ongoing road resurfacing and sidewalk projects. About $2.25 million has been earmarked for road and sidewalk projects, Vornlocker told the council. He said that figure could increase by another $500,000 if the township gets grants for which it has applied. There is also $750,000 targeted for sidewalks, he said. “The recommendation made from public works committee is we just continue the process of sidewalks and begin engineering and design of streets on identified needs list developed with the Board of Education several years ago,” he said. There is $100,000 in the police department’s operating expenses fund to purchase four cars, three Chevrolet Impalas and a Ford Fusion. Vornlocker said those cars come out of the operating budget, rather than the capital budget, because they are not expected by the state to last the minimum of five years. That amount doesn’t include outfitting the cars. Another 10 police vehicles are included in the capital budget, Vornlocker said. FTPD Lt. Phil Rizzo said the cars that are being replaced are over 10 years old and are not usable. One car was struck by a drunk driver while the officer was arresting another drunk driver, Rizzo said. Vornlocker said outfitting all of the new vehicles would cost about $349,000. The department’s 9-1-1 system has to be replaced at a cost of $235,000, Vornlocker said. The Naaman Williams Park pool should be fixed by Memorial Day, Vornlocker said. There are plans to buy new playground equipment for Bascom Park ($260,000) and DeLar Park ($340,000). At Bascom, “the playground equipment is end-of-life and no longer compliant with ADA,” Vornlocker said. The old DeLar Park equipment is being replaced with larger equipment, he said. There will also be upgrades at Middlebush and Inman parks, Vornlocker said. The township will also purchase a number of telephone poles from which to hang banners at different spots in the township. The need to purchase the poles arose when Public Service Electric & Gas refused permission to hang banners from their poles, Vornlocker said. The Open Space Trust Fund will be used to buy one set of the poles, which costs $9,000. The Hamilton Street Advisory Board will buy another set and the township will buy four sets, Vornlocker said. Two sets of poles will be installed on Hamilton Street, and other sets will be installed on Elizabeth Avenue, South Middlebush Road, DeMott Lane and Amwell Road, he said. Vornlocker said construction of Consolata Park could start this year if teh township gets the necessary permits from the state Department of Environmental Protection. The park is still budgeted at about $5 million. A proposal to convert two tennis courts at Castleton Park for use only for pickle ball stirred a lively discussion. Alice Osipowitz, head of the towsnhip’s parks and recreation department, said the demand for pickle ball courts has far exceeded the supply. “The pickle ball players have really taken it over and have dominated its use for pickle ball, so it’s really being used primarily for pickle ball and not for tennis,” she said. Councilman James Vassanella questioned why teh courts had to be converted for use only for pickle ball, since they were striped for both now. “Councilman, I will tell you that I will refer all of the people who have requested that these be converted to pickle ball to you … I’m trying to meet the demand of the public who have requested that these be made into pickle ball courts, and we are getting no demand for tennis courts,” he said. Vornlocker said new clerk and laborer positions would be created in the water utility to accommodate the increase in work there. Vornlocker said he expects to have a budget for the township to introduce in March.